I started off with 2 & 1/2 coats of Love & Beauty - baby blue because it's a really sheer polish. 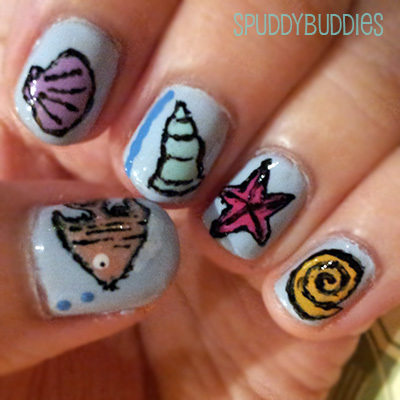 I used The Face Shop polishes for the drawings of the shells, fish and starfish. I would name them all but I'd have to go peer at what the code for each polish is and I'm lazy to do that. Maybe I'll name them later on. I used a black nail art pen to outline my little fishies and stars. See that odd blue line on my middle finger? You're probably wondering why there's a blue line in the middle of nowhere. I intended to make a border around the shell but... obviously the design was too big so I just left the line there. And if you look closely (or maybe not), you can see an odd patch of polish under the fish's gill. Haha, yeah I made a booboo and decided to patch it up. I patched it with white polish before going over with the blue polish. It's not very obvious from afar and I'm rather known for trying to salvage designs that don't turn out right. I didn't expect the fish drawing to be my favorite but it is! It's so pretty with the shimmery peach polish. If you had to choose one design you like most, which would it be and why? 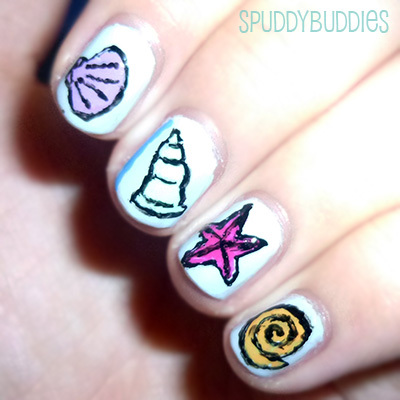 Ever done seashell nails before? I'd love to see them. No, thank you for having such an awesome link party. I found some bloggers that I really like. And I'll definitely be back next Friday. 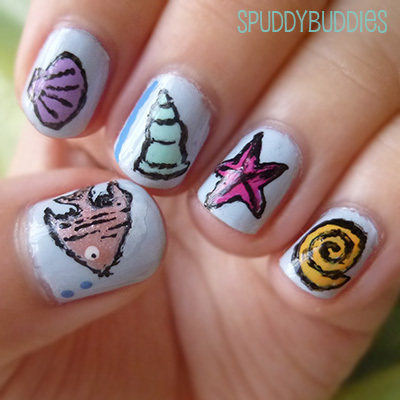 These are adorable - I love the style!! These are super cute. I've never heard of nail pens - those sound awesome! Do you find them with the polish at most stores? Thank you! Nail art pens are lifesavers for people with shaky hands like myself and can't seem to not mess up small details with a nail art brush. Hmm, I don't think you can find them at most stores but there are many that you can get online. These are adorable! 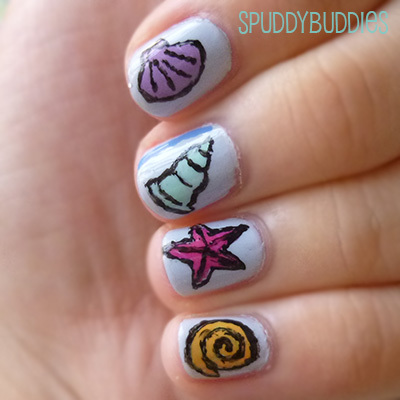 If I had to choose I would say the purple shell or pink star fish because they are so pretty :) I really appreciate your comment on my blog - I am now following you! Aww, thank you! The shell comes in as my second favorite design after the fish.